‘There are no age or beauty barriers.’ – Mistress Chrissy. 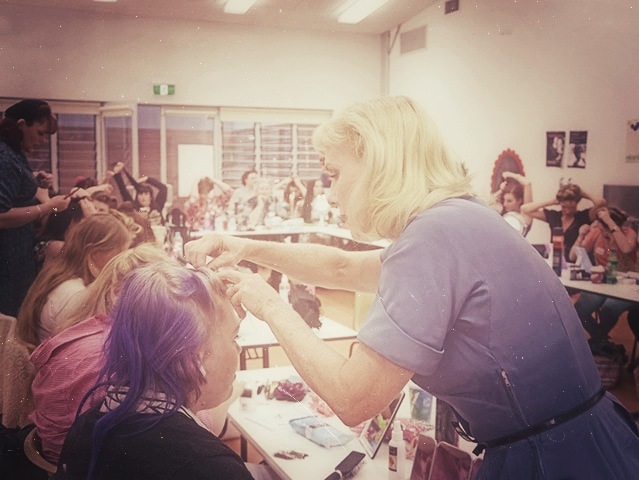 On Sunday I attended a vintage workshop put on by The Lindy Charm School for Girls. It was, truth be told, the first makeup workshop or hair workshop I have ever attended, despite my many professional years spent in front of cameras. It seemed like a fun opportunity to spend an afternoon with some other vintage lady-geeks and further my vintage repertoire. It would be easy to scoff at such an idea, but ‘no age or beauty barriers’ is a fairly apt statement. Unlike most magazines, ads and blogs focussed on such topics, it struck me that workshops like these (and the vintage scene in general) might afford one of the few opportunities for women who don’t feel they fit the current ‘beauty standard’ to enjoy their physical appearance without feeling marginalised. Young, old, slim, large, short and tall, each woman appeared to enjoy the experimentation with their style. They each left with a broad smile and a noticeably straighter posture. Whatever each of us had come for, there was no doubt we had escaped the mundane for 3 hours, enjoyed a splendid time and picked up some interesting style tips and trivia on mid-century history. What prompted you to start The Lindy Charm School for Girls? Although being involved in “The Scene” through Vintage Collection/Styling and Dancing for the past 20 years, the Lindy Charm School for Girls was a natural progression from teaching my own dance students how to re-create and style themselves based on the swing era which was the music they were predominately dancing to. These home based “Styling days” became so popular that I decided to take it on the road and share the knowledge around Australia and New Zealand and more recently the US. 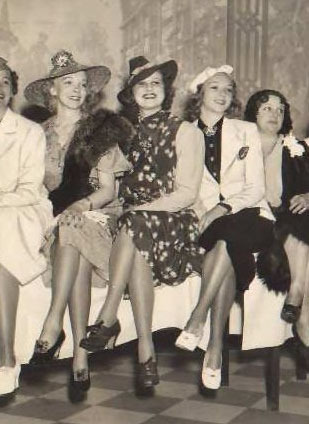 There is much we can learn from our foremothers who trail blazed for the freedoms and independence we enjoy today and with the beauty of hindsight, The Lindy Charm School for Girls preserves and imparts only the best of the past to enhance our present. What first made you enthusiastic about vintage? Everyone starts from a different place but most people seeking out a vintage lifestyle have a penchant for the history of old. I grew up with the music & films of the 40’s and 50’s with my dad. My favorite memory of growing up was Saturday afternoon movie time with him – always Jerry & Dean or an Elvis Flick and always in black and white. My eye for the fashion and style came from then but it was when I was introduced to the Dance (“Lindy Hop”) my passion for swing music grew then came the fashion/lifestyle of the 30’s and 40’s. I remember when I got my first 1940’s original crepe A line frock with beautiful beading on it. I was in heaven and I matched it with the right hat, accessories, hair and makeup and walked in to my parents home and Dad teared up. Being a soldier, that NEVER happened. He said he thought his mother had walked home. What has been some of the most common feedback on your workshops? A couple of stand-out comments that have had an impact on me was a letter from a young girl’s mother saying she believes that the Charm School experience had saved her daughter’s life who was battling with depression, self harming and trichotillomania. She follows us on FB and pops up now and then to say she is still doing well. Another letter that had a real impact was an email from a girl who had been bullied heavily and was very depressed… I asked her what made the difference and she said the workshops made her see her beauty and worth was there, and once she believed she had it she grabbed it with both hands. To find out more, go to The Lindy Charm School website. Above: Mistress Chrissy (in blue) helps with a hair style at the workshop while her assistant Miss Sammy (in black hat) advises on bobby pins. 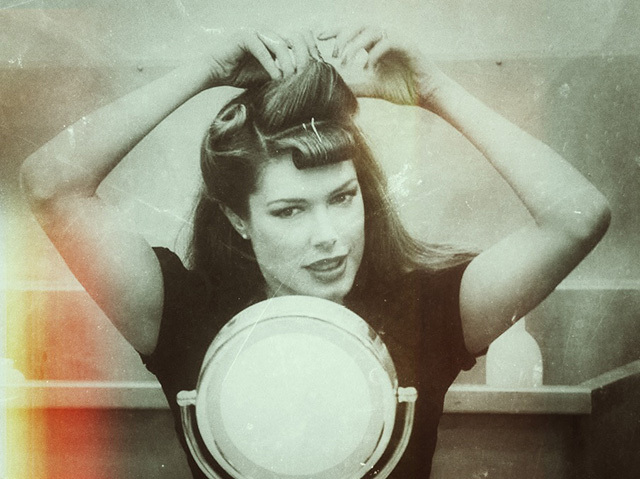 Below: Rolling up my sleeves and getting into the 40s spirit. * Photographs courtesy of Dimity Mullane. * Note: This post has not been sponsored. In fact, none of my posts have been sponsored. For more posts on Vintage, click here. This looks like so much fun! So far all my vintage styling knowledge has come from YouTube channels such as LisaFreemontStreet, but it would be lovely to go to a workshop and get some hands on suggestions! It was a delight! Looking forward to the advanced class! I was also one of the lucky ones to attend. Tara you’ve created a great description of the afternoon! So much fun- I didn’t know I had so much to gain from the experience until I left it! I’ve been online looking for a perfect vintage outfit ever since and am wearing flowers in my hair. Vintage Love To You To Tara,well said.Have done a workshop in WA from this followed by many things like a pin up competition at age 50.No matter what age or size if we can make one person feel happy/beautiful about them selves then I think our vintage powder puffs have worked a treat! Great description of the afternoon and was lovely to spend time glamming it up in Charm school. I am now addicted to searching for the perfect vintage dress and accessories for my upcoming bridal shower! Was great day and had great fun! Thanks Tara & Thanks Miss Chrissy & the ladies!! !